Momma Lew recently had the chance to enjoy the new children’s book series, Ballet Cat. You can read all about this series here. 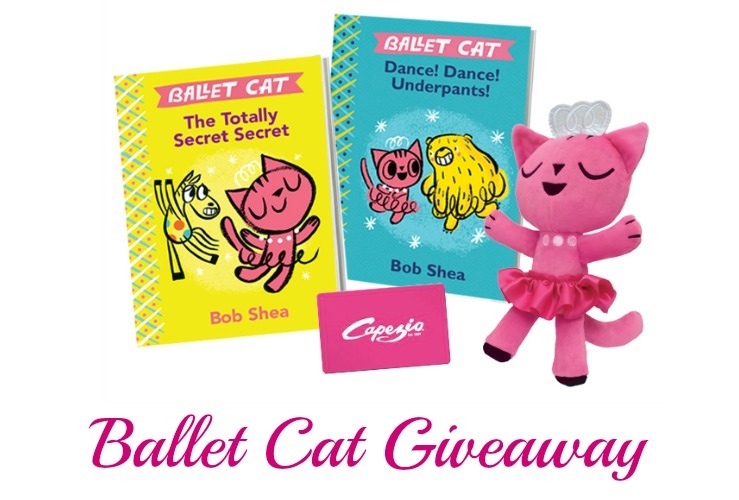 Would you like to win a DANCE, DANCE prize pack for your little ballet cat? · Plus a $50 Capezio.com gift card to outfit your little ballet cat! Giveaway open to US addresses only. Prizing and samples provided by Disney-Hyperion. Giveaway ends 2/15 at 11:59p ET. I would give this to my granddaughter who is a ballet dancer. I would love to give this Ballet Cat prize to my little niece. I would give it to my daughter! She will love it! I would give this to my daughter for her birthday. She loves ballet and reading so this would be perfect for her. I would love to win this for my daughter! She would be so excited! I would give it to my niece. she loves ballet. I would give this to my friend’s little girl! This would be for my little sister… She loves cats and dancing. One of my little granddaughters is taking ballet classes so she would be gifted this from me. I would give this to my little niece who is in a bitsy ballet class,she would love it! My grandaughter Evelyn would love this book I’d give it to her.